Over the Easter break, during all that glorious sunshine, I was having fun being a skydive cameraman, jumping with and filming a team that is learning to compete in 4-way Formation Skydiving – a discipline within the sport which comprises 4 skydivers turning a series of pre-determined shapes in the air during a timed 35-second freefall. 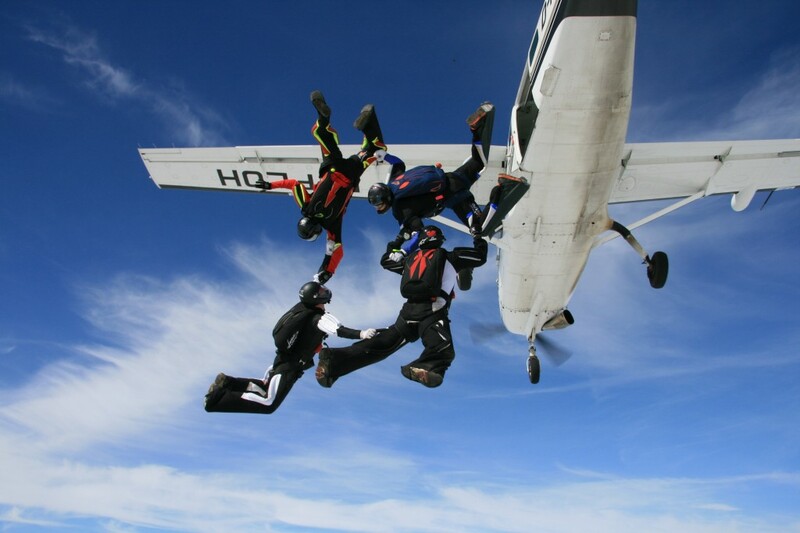 It takes excellent freefall flying skills, clear mental visualisation and fantastic synchronised teamwork to do well. These were novice competitors, training for the Rookie class, the first and easiest of 4 levels of progressively more complicated and difficult formations. There are only about 2,000 active skydivers in the UK, which makes it a very small sport with an intimate and close-knit community. There is no great public following with its associated TV or sponsorship deals, and one of the benefits of this is that for comparatively modest fees you can get world-class coaching from an internationally-renowned competitor. Their coach this weekend was Claire “Sparky” Scott, holder of 5 World Championship Gold Medals (see more about Sparky on her website here). This is a bit like your pub football team being able to book Beckham or Ronaldinho for the day! What I love about watching Sparky at work is the way she treats the teams she coaches. She achieved her own medals through years of sacrifice and hard work as a focussed, determined and incredibly hard-working competitor, and she gained success by dedicating thousands of hours, and tens of thousands of pounds of her own money, to train and compete until she achieved her ambitions and rose to the very top. I don’t believe she can conceive of another way to approach the sport, and so she just treats every single team member as a potential world-champion-in-waiting. The consequence of this is that from the get-go they start to think of themselves in the same way, and very quickly raise their own game. Over the four-day camp you could see the team starting to appreciate the level of work, fitness and concentration required, and really start to apply themselves. They made very noticeable improvements in performance, and left with determination, a training programme and a clear path forwards. All of which made me think of how we treat those whom we train, mentor, coach and manage at work. What would be the effect if we just assumed every single person was a potential world-class-performer in their field, who just needed a little help and guidance to achieve great success? How would it change their view of themselves and their abilities, if what they saw constantly reflected in our eyes was a champion-in-the-making? If we simply presuppose that they are destined to succeed, and let them know that through our behaviour and our words, isn’t it that much more likely to come true?